At the moment the four best places to test autosomal DNA in alphabetical order are 23andme, Ancestry.com , Family Tree DNA, and MyHeritage (good european records and trees).). New DNA testing companies, not yet reviewed by me are LivingDNA (best breakdown of ancestral locations in the British Isles). If you test at Ancestry.com or 23andme or MyHeritage, you can take your results and upload them to Family Tree DNA to see your matches there for free plus get their full tools for a small price ($19). Whichever one you use, upload the results to GEDmatch.com in order to compare to people who have tested elsewhere as well as get some different ancestry composition results. You can benefit science and get some more information and another view of your ancestry composition by uploading your results to DNA.land (see my blog post about that site). MyHeritage.com is also taking DNA uploads of other companies’ test results. I created a comparison table of the things I consider important for my recent DNA Basics talk. You can see the slide at http://slides.com/kittycooper/dna-basics#/29 – Since that chart was created Ancestry.com has increased in size to 10+ million testers! More than twice the size of the next largest. Unless you want to join a specific surname project or have mainly non-USA ancestors, I recommend that you test at Ancestry.com – which is best for the non-serious genetic genealogist because of its tree matching and interesting presentation of your historic ancestry. If your ancestors are British, LivingDNA has the best breakdown of which area of Britain they are from but they do not have cousin matching yet. If your ancestors are recently non-American, then use 23andme which has the largest non-USA database. MyHeritage and FamilyTreeDNA also have many foreign testers, but very few Germans have tested at all and those few are at Family Tree DNA. Use Family Tree DNA or MyHeritage for older family members since the cheek swab is easier for them than filling a vial with spit, note that Family Tree DNA saves the physical DNA for up to 25 years so more tests can be done on the sample later. Additionally perhaps get your Y STRs tested at Family Tree DNA if you are male and interested in your paternal line. Whichever testing company you choose, you can then upload your raw data to GEDmatch.com, DNA.land, and MyHeritage.com to find matches from other testing services who have also uploaded to those sites. LivingDNA is also accepting uploads but they will not have results until next summer. Here are the details about each company in alphabetical order. Twice the price of the others (currently $199) but only $99 if you skip the health part. Best ancestry composition of the three. Gives you health related information about your genes. Has the second largest database and the most international customers (lots of Norwegians, very few Germans). By far the largest database and getting larger every day because of all the folks with family trees there. You cannot do chromosome comparisons with other testers there so you have to load your data to FamilyTreeDNA or GEDmatch or DNA.land for that. Wonderful automated tree matching for your DNA matches which can be used with private mirror trees to help adoptee searches. Can compare yourself to anyone you match, so better for adoptees than 23andme. If you buy your test through a project you may get a discount. Has many Jewish testers and includes Sephardic jewish ancestry composition unlike any of the others. Commits to storing your DNA for at least 25 years; thus additional tests can be run on it. Uses a cheek swab to collect the DNA, rather than spit, which the other two use, so better for old folk. Can test STRs on the Y chromosome which are more useful for recent genealogy, for surname research (father’s father’s father’s etc line), but this is a separate test from the family finder test. If you want detailed health results and can afford it, try GENOS at $499 which claims to sequence your entire exome, thus 50 times more SNPs than the genealogy focused companies listed above. Disclaimer: I am an affiliate with all three of the main companies so if you click one of my links and buy a kit, then I get a little something. NB: Of course since 23andMe changed their chip at the end of 2013 you can no longer upload new test results from 23andMe to FTDNA… Although FTDNA expressed interest in reinstating the transferability, it seems unlikely that it will work out. Thankyou for this information. Very concise and to the point. Much appreciated (as you will already know from the FB site). I need to prove or disprove a long standing family story of american Indian ancestry in my genealogy research. I have done the 1.0 Genome DNA test which only test mitochondrial sense I am a woman and came back with Northern European background. Is there a new test I could take that would show if there were American Indian DNA anywhere in my lineage? Unless it is recent, within a few generations, the autosomal DNA from a distant ancestor can easily be gone. Test the oldest family members on the line expected to have Native American with the autosomal test at 23andme for the best ancestry composition. Then a trace may still show. mtDNA, which you did, needs to be on the straight maternal line that is expected to be native american, mother to daughter, to show that group. So if your mother’s mother’s mother’s mother’s mother was native american then the mtDNA would show this. With a 2.5 estimated # of generations to MRCA, I’m trying to determine how he fits in the family. I know for sure, the connection is on my Father’s Mother’s side based on other distant relatives connections or lack there of. My suspicion is that his Father is a half sibling of my Father’s Mother. Do half cousins show up differently in the Estimated number of generations to MRCA? Is there a way to prove or disprove this theory? Estimated generations is just that, an estimate. Below 4.0 they are reasonably accurate. 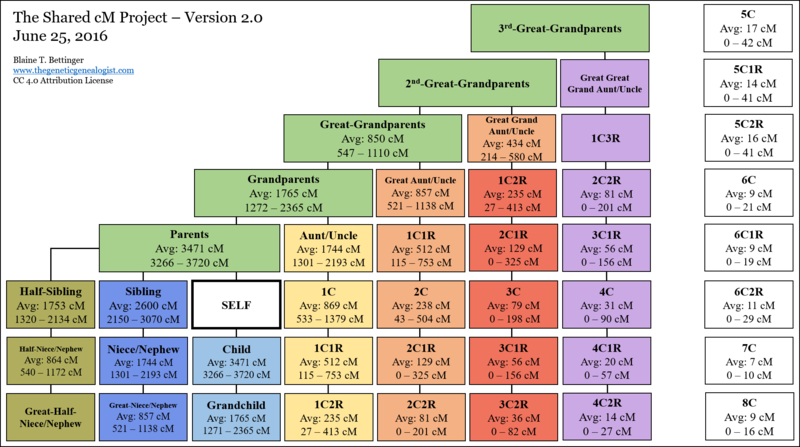 If you look at the latest charts you will see that 2nd cousin, 1st cousin once removed, and half first cousin (take half the first cousin number) all fit. Your theory is a half 1C1R which is possible but the actual cMs are a bit high for that although in range. The best way to solve this is to test more people. Obviously his father and your mother if available for testing, but other older generation folk, siblings of his dad or your mom would help if those two are not available. Sometimes it helps to draw diagrams to see who else you might test that would narrow this down. How do I convert yDNA test results from my late cousin’s 2006 Relative Genetics 43-marker test to my 2017 FTDNA 111-marker test? At DYS452 he is 6 and I am 25. At DYS463 he is 20 and I am 22. Have you entered his Y test into the database at http://www.ysearch.org/ – that is where you can compare him to others tested elsewhere. I want to buy DNA tests for myself, my husband, and my two adopted children. Mostly I am just curious about where we come from. It is my understanding that some companies are vague with regard to geographic area of ancestry. I would like to know specific countries of origin. I am not interested in finding relatives at this time. Some information about health issues would be great. Also, I am wanting the test to be reasonably priced and easy to administer. Would you be able to recommend one company over another? Thanks much for your blog. Meg, for your needs it sounds like 23andme is the test you want. Amazon has it on sale recently and it may still be … however it is not that reasonably priced. Ancestry is cheaper and you can upload the results to prometheuse to get some health information. You meant Promethease.com (sp) I believe. Thanks for Sharing valuable information. Keep updating It. I DESPERATELY NEED TO UPLOAD OR TRANSFER A NOW DECEASED RELATIVES Y-46 DNA TEST SUBMITTED THRU ANCESTRY SEVERAL YEARS AGO. I CAN STILL VIEW IT AS A REPORT, BUT IT IS NOT COMPATIBLE WITH ANY OTHER WEBSITES SUPPOSEDLY? I TRIED TYPING THE INFORMATION INTO A FORM ON FAMILYTREEDNA.COM TWO YEARS AGO AND MANY EMAILS LATER, HAVE NOT HAD ANY COMPARISONS OR ANYTHING. I HAVE NO IDEA HOW TO GET THIS DATA INTO GEDMATCH OR ANYWHERE ELSE TO HAVE COMPARISONS RUN. WHAT WOULD YOU SUGGEST I DO WITH THIS CRITICAL DNA. WE DO NOT HAVE OUR GRANDFATHER LOCATED AND THIS IS HIS SON’S DNA. My sister and I both did AncestryDNA. 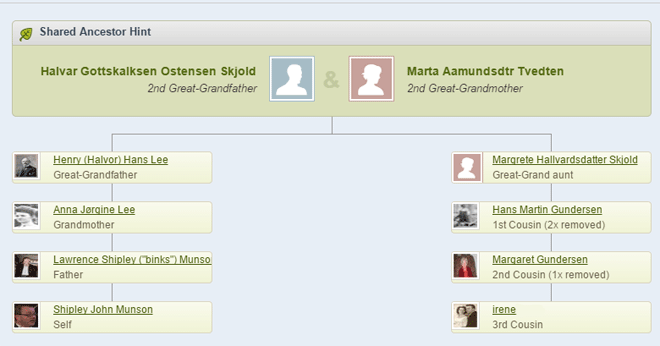 I am the one very interested in ancestry and trying to put our tree together. In our results I get a lot of different matches than she does and vice versa. And the ethnicity is a bit strange. I have Italian 40% and she 0%. She has European Jewish I have 0%. As well the cM shared is 1703 over 79 segments. Could we still be full siblings with this information, or are we half siblings? Very curious…she opted to do 23andMe to see if it will show her with Italian ancestry. Still waiting for that. I have already done the 23andMe. Share your thoughts on our relationship. You are almost surely half siblings with that amount of cM. The 23andme results will be conclusive. You could both upload you ancestry data to gedmatch genesis to find out for sure as well. No 23andme’s Y is not sufficient as it just gets the haplogroup from the SNPs. If the haplogroup is not the same then they are not from the same male line ancestor. However if it is the same, nothing is proven yet since haplogroups reach thousands of years back. For more recent genealogy you need to do the STR test to at least 37 markers at family tree DNA to confirm a common male line ancestor.